The walk from Nema HQ to the local village isn’t too far but in hot mid-morning sun our initial enthusiastic pace slows down to a more sedate lumber. I’m quite pleased and refreshed when the recent rains have flooded the road and we need to wade through holding our modest long skirts up. As is so often the case, we know we are approaching the village when the rubbish starts to appear. Plastic and the lack of any form of municipal rubbish collection appears to be a mounting problem in most developing countries, Mozambique is no exception. But it’s not too bad yet down to the fact the area is still so poor that very few commodities are not made from the local natural resources. The communities here are subsistence farmers and fishermen, they have very little spare food to sell and as a result virtually no income to spend. Guludo Lodge, whose owner started the charity and where our charity manager Lisa lives, was founded on the principal that it would work with the local communities and environment in every way possible. The building materials, food, employees and supplies are almost entirely sourced in the area. The only items which are not bought locally are alcohol, dive school kit and wind up torches. Once we arrived in the village, about a mile from the lodge, we visited some of the charity’s previous projects. First stop was the Guludo school – one of the first projects. The block of four classrooms now offers education to 240 kids over 5 year grades. The kids don’t necessarily start school at 5 and finish at 10 years old, they come in and out as allowed by their parents’ funds since there is a small fee for books they must cover. What’s more, they may only progress to the next year once they have passed the end of year exams. As a result there are children of all ages in each class – some groups have an age difference of up to 5 years which makes it tricky for the teachers. Guludo school would like to have 7 year classes but there is just not enough space and the head teacher comes to explain how useful it would be for the charity to build another two classrooms to prevent those pupils in years 6 and 7 from having the walk the 3 miles or so to the next village or, more often, stop going to school altogether. We agree to consider his suggestion, but first we need to assess the needs of the other communities – several of which have no school buildings at all following the worst rains in history earlier this year. 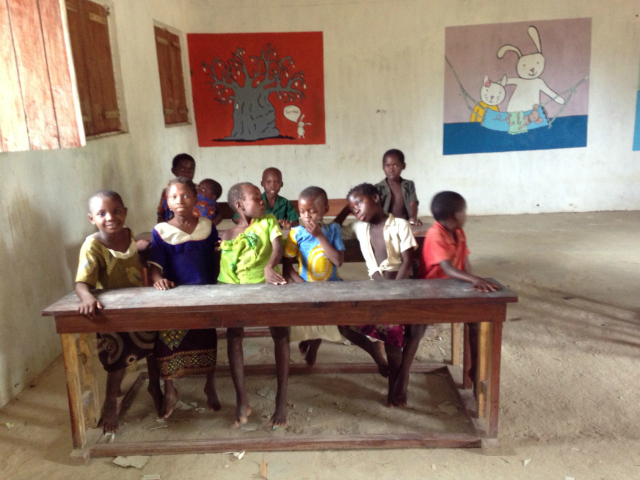 The school in Guludo – spot the famous JoJo bunny in the background! Nema means “happiness following hardship” in the local Kimwani language and is a perfect name for this charity. I’ve travelled quite a bit in developing countries and whilst I have witnessed poverty of a comparable level, there are few places in the world which have a tough a time as these lovely smiling people. The recent rains were so prolific and backed by winds of hurricane force. Whole villages were wrecked, rivers, which are generally dry, flooded and bridges collapsed, cutting off communities. In an area where there is not enough water most of the year it is ironic that the floods caused such damage. Guludo Lodge was hit with a force that devastated half the guest bandas (huts) and need total renovation. The environmental policy to build only from local materials which would dissolve back into the ground seamlessly has proved itself. Wind and rain has started the process effectively – just a little prematurely. Despite the tough conditions for the most part the weather here is perfect; blue sky, warm days and nights and a cool sea breeze. It’s heaven from a visitor’s point of view and the rainy season is short, leaving stunning dry weather the rest of the year. You could not wish for a better placed beach holiday but for the local farmers it means water is a valuable commodity and in scarce supply. We do our best to help where needed by installing and rehabilitating water pumps and developing rainwater collection systems in underground tanks. After having visited the new school we meet some of the craftspeople who used to work in the Nema-built craft centre. It was a great project; a small workshop space where locals could learn how to make baskets, fabric and jewellery to sell both to tourists at the lodge and a middle man who would send them on to the city. This project provides a valuable source of income where are there no ‘jobs’ as such, other than those at the Lodge. For the past few years the centre has been well used, as a little factory space for the self-employed during the day and a community meeting point after work. Tragically, a bush fire spread through the area six months ago taking the building with it. What was left of the structure was returned to dust in the recent rains. It’s sad to see one of the charity projects reduced to nothing but this is the reality of this country – bad things happen here. But the local craftsmen and woman laugh and smile telling us they are now working under the shade of the big tree. Life is not so bad – “Nema” they tell us! (Happiness following hardship.) Another project to consider…how important is it to rebuild the craft centre? More or less than the two extra classrooms at the village school? As we walk through the village, a crowd of children follow, laughing and joking. The cheekier ones want us to take their photo and show us the result on the playback. Digital cameras are a godsend here, where being able to take a quick video and then play it to the fascinated audience offers a well-earned reward. In some Islamic cultures that I have visited the locals prefer not to be photographed; apparently it “takes away your soul”. Thankfully they are moderates here and beg to appear on the camera. I always ask the adults first – and some of the older men and women refuse which naturally I respect. I don’t really blame them – it would drive you mad if a tourist walked into your yard and asked you to smile for the camera. On to visit one of our charity employees at home. 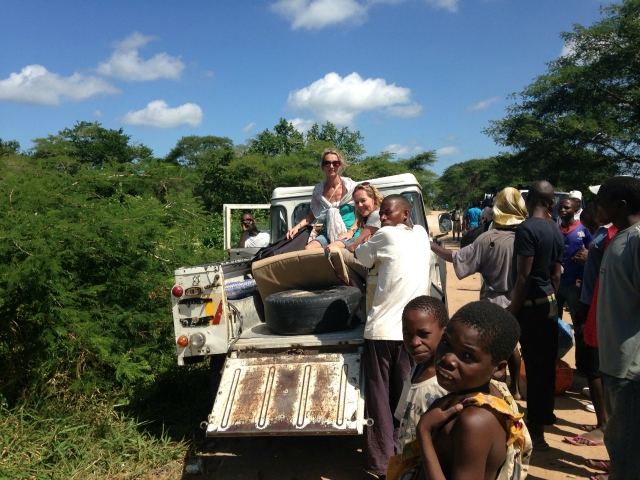 Assani is Team Project Manager and we need to assess the situation with our charity workers’ transport. Nema provides bikes for the team to get around but the road conditions and long journeys regularly made have taken their toll. The bikes are only a few years old but they are in a shocking state and we agree readily that repairing and replacing the worst cases is a vital project. No need to assess this one too methodically – some of the communities that we support are 20 kilometres away and since the bikes have been broken our workers walk to visit. Walking long distances is not unusual here; people walk many, many miles going about their daily duties. But walking this far is not practical, the time taken to get there means virtually no time to work before they must set off home. So FIRST JOB, mend and replace the bikes. 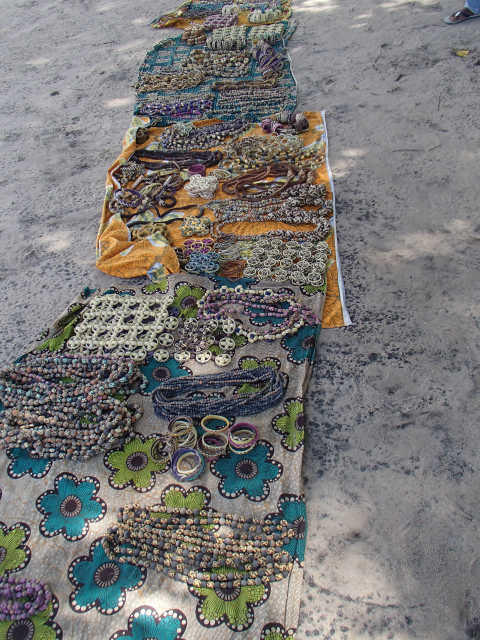 JoJo will be happy to fund this as part of our remit to cover the charity staff and general overheads and I suggest to Lisa that we return to Pemba a day early and try to get this sorted and sent back to Guludo on the next truck heading that way. Next we are off to see to the chicken farm, a Nema funded business. 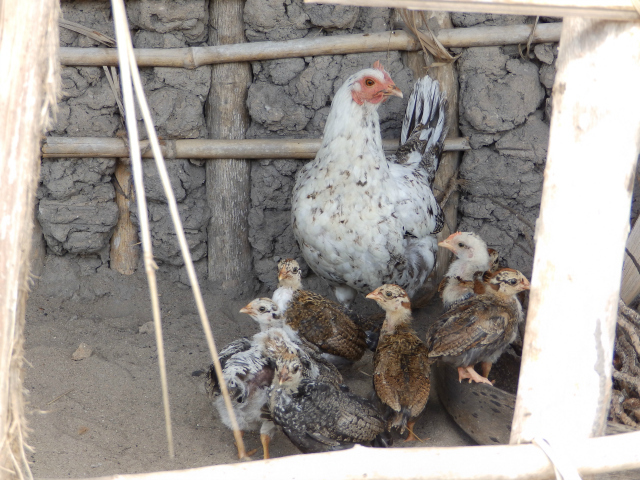 75 hens were purchased last year to start this brilliant little micro loan scheme. The hens are given to the villagers who pay for the loan repayment by selling some of the eggs to the lodge. Interest is also paid by giving some of the chicks back to the farm which will keep growing chickens to loan out. The system should work smoothly unless disease hits the farm – which, guess what – it has recently! Half the chickens died, but this type of thing has to be expected. Bad things happen here. However, Reno, whose job it is to manage the farm for Nema tells us he is replenishing the stocks by letting the chicks hatch for a few months. This makes perfect sense but just means no eggs to sell to the lodge – not ideal for the poor cook who bakes a delicious fresh cake for the guests each day. We are asked if the charity could build another cage to put the new chicks in once hatched, protecting them from the bullying older hens. This seems an easy-to-tick-off project and we’re determined to provide the materials for Reno to get this done the following week. He only needs some bamboo poles, chicken wire and a metal feeder – I’ve added it to my shopping list for our last day in Pemba. The walk home is very hot and I’m wishing I had brought suntan lotion with me. I’m excited by what we have seen and a little depressed too. The reality is that there is just SO MUCH TO DO here, and we have only visited Guludo village so far – probably the wealthiest in the area due to its proximity to the lodge and the fact that 36 locals are offered employment there, bringing a really important injection of cash into the economy. Thankfully the eco sourcing rules have been relaxed to satisfy thirsty tourists – that cold beer really is “Nectar of the Gods”.